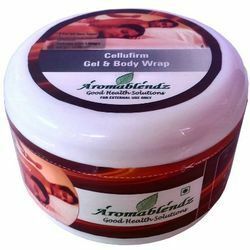 Manufacturer of a wide range of products which include aromablendz cellufirm gel & wrap clove, aromablendz cellulite control oil, aromablendz thermogenic weight loss wrap, aromablendz cellufirm gel aqua, aromablendz cellutone oil and aromablendz skin firming detox herbal pack. Method of Application: Hot water application for 30 seconds on the body part is advised before applying. 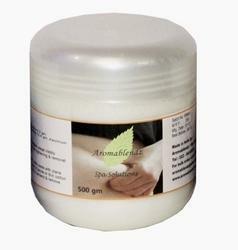 Take 20 to 25 ml gel & massage using kneading strokes for 15 to 20 minutes post Cellulite or Cellutone oil massage. Take cling film wrap it around the massaged part. Warning: For external use only. Keep out of reach of children. Discontinue use if skin irritation occur. Cellulite describes dimpling of skin, caused by the protrusion of subcutaneous fat into the dermis creating an undulating dermal-subcutaneous fat junction adipose tissue. Descriptive names for cellulite include orange peel syndrome, cottage cheese skin, the mattress phenomenon, and hail damage. Synonyms include: adiposis edematosa, dermopanniculosis deformans, status protrusus cutis and gynoid lipodystrophy. Between 85% and 98% of post-pubescent females display some degree of cellulite. Cellulite is not related to being overweight; average and underweight people also get cellulite. While harmless, the dimpled appearance is a cause of concern for some people. The cosmetics industry claims to offer many remedies. 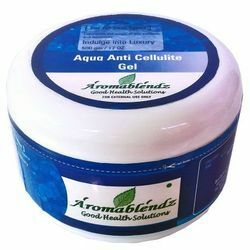 The most effective of them being gels and oils for reducing cellulite. Even Liposuction, which extracts fat from under the skin, is not effective for cellulite reduction. Dieting does not get rid of the dimpled appearance, but balanced eating, drinking and exercising may help. Cellulite has been found to be indistinguishable from ordinary fat in every medical and scientific test. Studies have proven oils, cosmetic lotions and massages reduce cellulite by break down of the formation pattern of adipose cells. The most effective way to reduce the appearance of cellulite along with oils and massages is to is to reduce overall body fat by altering diet or exercise, although it may remain visible even on very slim women. The cause of cellulite is unknown. But, some theories point to stress, and diet as potential causes. Sesame extracts, Mineral extracts, Flax seed extracts, Weed sea extracts, orange willow bark extracts, green tea extracts, garcinia extracts, Added thermogenics and protein bonding skin tightening collagen pre cursers. The oil has mineral extracts which allows a slow sustained penetration into the dermis. Its theromgenic effect increases local temperature and with the assistance of an already catabolic environment (ie. After cardio) it keeps the fatty acid mobility continuous from the adipose cell. Local external hot water application will help. The oil will is excellent for problem areas, as it allows enhanced fatty acid movement which otherwise would have been restricted to the pre disposed genetic framework. The protein bonding precursors will assist in creating a tightening effect and help in the toning. Certain extracts due to its high potency can cause allergic reactions on the skin and trigger a bronchial constriction. Avoid during pregnancy and if after a single sitting develop some skin discomfort. Also not advisable for persons who have a history of Asthma attacks. This powerful preparation with Aloe vera as the base has strong moisturizing, rehydrating & firming properties. Method of Application: Hot water application for 30 seconds on the body part is advised before applying. Take 20 to 25 ml gel & massage using G5 massager for 15 to 20 minutes post Cellulite or Cellutone oil massage. Warning: For external use only. Keep out of reach of children. Discontinue use if skin irritation occurs. The power packed Cellu Tone massage oil with dual action effect increases fatty acid movement & controls cellulite formation. It improves recovery & muscle tone by flushing out toxins & reducing soreness. Its powerful thermogenic effect increases temperature & keeps the fatty acid mobility continuous from fat cells. The oil is excellent for treating problem areas. Its added collagen stimulating precursors reduces premature ageing of the skin. Method of Application: Ensure a gap of 3 hours between meal & the massage. 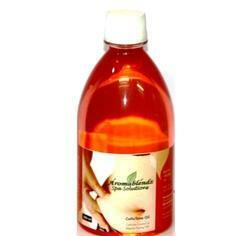 Place the warm towel intermediary for 30 secs before application of oil on desired body part. Using firm kneading strokes, massage on cellulite prone areas for 10 minutes. For best results, conclude the treatment with Celluform Gel using G5 massager or Cellufirm Balm with Polythin Wrap for 15 minutes & 5 minute steam thereafter. Chinak with added protein bonding skin tightening collagen pre cursers & Excipients. Leave the oil for 15 minutes to check for sensativity or irritation by conducting an underarm patch test. Discontinue use if skin irritation occurs. For external use only. Keep out of reach of children. Use to: This pack has powerful reaffirming, tightening and lifting actions. Regular use gives the skin lasting firmness and resilience, leaving your skin looking younger and radiant. Method of Application: Mix pack with warm water to get to a thin paste like consistency & apply evenly to cover the treatment area. Leave for 10 to 15 minutes till it dryes & gently wash off. Composition: Cyprus Rotundous, Aloe barbadebse, Embiliaribes, Aloevera Extracts, Silica, Lavender, Ayurvedic proprietory herbs and Excipients. 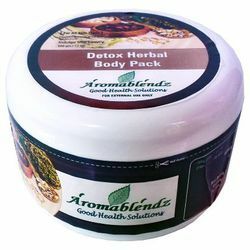 Looking for Aromablendz Slimming And Weight Loss ?